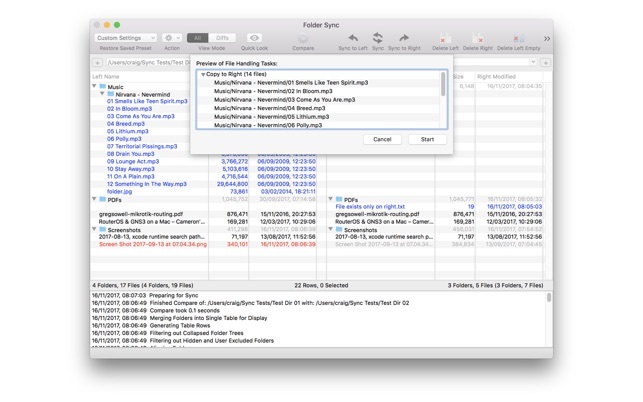 Keep multiple pairs of folders in sync, quickly and easily. Great for backups and for managing content on USB drives, memory cards, and other computers/drives on your network. View differences between pairs of folders on screen using user defined coloured coding. Folder Sync allows you to utilise a fully automatic sync (Sync to Left, Sync to Right or Sync Both Ways) making only the required changes to keep this as fast as possible. You can also manually manipulate the files yourself in order to copy or delete just the files you select for the ultimate in control, something that other synchronisation applications do not offer. 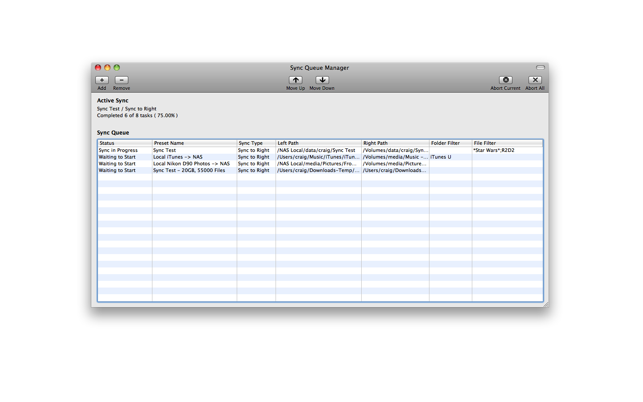 Built in scheduling abilities and option to run as a Menu Bar Application. • Run as Menu Bar App or Standard App. • Fast Comparison Engine based on Modified Date and File Size. 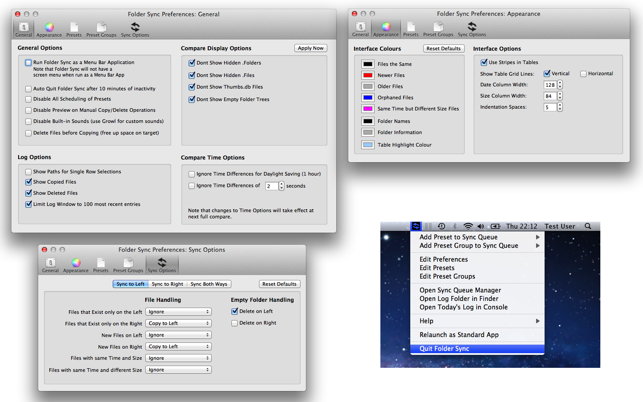 • Fast Synchronization Options as only the files that are different are manipulated. 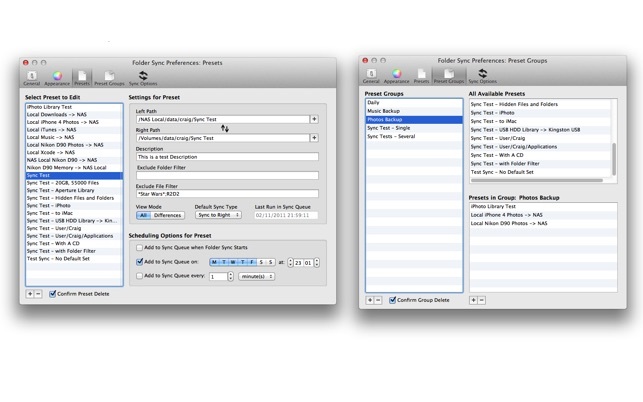 • Ability to save pairs of folders to Presets for quick and easy repeat of synchronisation. • Schedule Presets to run at any specific time on any chosen days (iCal not required). • Presets can be set to repeat automatically at user defined time intervals. • Presets can be grouped to allow complex backup sets to be created and run with ease in the Sync Queue. • Users have the choice of using automatic synchronisation options or performing copy and delete tasks manually. • Provides a preview of all changes that will take place prior to actually committing those changes to disk. • Sync Macs across a network. • Multi-Touch track pad support offering fast scrolling and difference navigation. 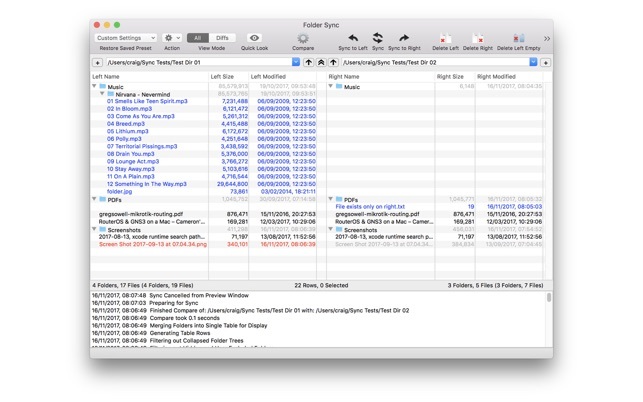 • Quick Look and Finder Integration. • Very Configurable Interface and Synchronisation options. • Filtering abilities to allow you focus on the differences that need your attention as well as easily excluding folders/files. • Powerful built in selection commands allowing you to quickly grab the files you need, great for those manual synchronisations! • Run Syncs in a Sync Queue at the same time as working on another Sync in the main window. I’ve been using this app for a couple of years by now. My overall experience is that this app is very reliable and works well. At the beginning it may appear a abit confusing if one is not used to the configuration (e.g., sync lef to right, right to left, both ways, deleting the same title older file, etc.). I’d suggest a careful trial and error - put your syc logic on a pieced of paper, think through how you want the files to be deleted and retained, in which directions. If not careful, you may delete the files you want to retain or endlessly duplicate copies that take your dirver space. But it’s easy onece you work out the configuration, and very reliable if your’ve worked out the setting up of the configuration. I use a portable drive as my “base storage”, and work on this portable drive everday. At the end of the day (or some important moment), I sync from my portable to my desktop or laptop. This way, there is no confusion of the “direction” since it’s always from “right” (my portable) to “left” (my desktop or laptop). In comparison with some other apps, a weakness is that it’s not easy to see which files are going to be synced after comparing the two sides of drives. But I’ve decided not to bother seeing the files since I’ll sync the whole drive anway. Of course, if you need you can just select the particular folders to sync. THis software has become part of my daily routine especially when working on large projects with my assitant. It allows me to reliably (yes, reliably) synchronise upward of 32,000 files, per project on a daily basis. It has features such as the ability to filter out file types - which is great in my work as the music software I run creates many many cache files that become out of sync but do not need copying as they self generate during the day. Music software accesses many many files at once to run a single project, and can be very picky about creation dates etc etc and throw up errors if things are not right. Using folder sync I never get these issues. Pay for it. It’s worth it.